We are Cambridge Cinema Shorts and we are a group of people with a passion for Short Films. We are based in Cambridge (UK), and have been showing both local and international short films since 1998. We began life as the Strawberry Shorts Film Festival and still run it as our showcase event. It was, at the beginning, a small festival primarily designed to give local film makers a platform. However, it soon became apparent that there was an ocean of short films out there and to ignore this cinematic treasure trove was a dereliction of duty to ourselves, Cambridge and the wider world. 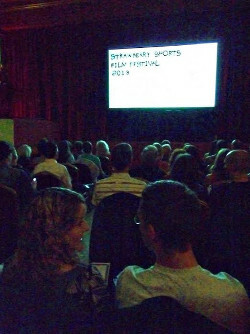 In 2006 we gave ourselves a make-over, changed our name to the much more inclusive and descriptive Cambridge Cinema Shorts and widened our horizons. Since that date we have transformed ourselves into an internationally recognised organisation bringing films from around the globe to our public. We have also expanded our activities from simply screening films to running educational events, holding seminars, promoting and encouraging the making and distribution of short films and using our equipment and knowledge to facilitate others. We are, as we have always been, a team of unpaid volunteers and any profits we raise from running our events we plough back into the organisation. Short films! What are they? Short films are made for many reasons and come in many guises. Some are funded by local and regional governments that do not have a Hollywood or Bollywood to facilitate their film industry, but local art and creativity is not something to be squandered and funding is found. Some are made by individuals or groups to promote a cause or highlight an issue, but most are made by people with just as much of an urge to make films as the Hitchcock’s and Spielberg’s of this world and lack of cash and contracts will not deny them. Short films, because of their time and budget restraints, are often honed to the essence of film making, pared down to produce exquisite jewels of the craft, cut and polished until a couple of minutes of low budget film can have more impact on the viewer and stay with you far longer than two and a half hours of Hollywood blockbuster ever did. Short Films are an art form in their own right and we passionately believe that they should be seen and enjoyed for what they are by as wide an audience as we can possibly muster. They come in bite sized chunks and are easily digestible, so please come to one of our film nights for a taste. We promise you will not be disappointed and it could be the start of a passion that will brighten your life.